For this week’s Medieval Romance Monday feature we are showcasing Laurel O’Donnell’s Champion of the Heart. It’s a medieval tale filled with a grand tournament, a haunted castle and some very troubled and tormented characters. Here is a quick excerpt. Enjoy! … the black knight moved forward. He lifted his sword high in the air to meet Evan. The metal clanged loudly, sparks flying from their striking weapons with the force of their attack. Again and again their swords met, each blow quick and powerful. Both men appeared to have suddenly been re-energized by this final confrontation, their strength surging back into their bodies. Who was he? Jordan wondered as the black knight deflected all of Evan’s attacks. He stood bravely against Evan, matching him skill for skill. Why did he wear no crest? Jordan’s heart pounded and her hands played nervously with her necklace. This black knight was the best Evan had come up against. The black knight raised his weapon and brought it quickly around to the side, hitting Evan in the arm. The plate mail deflected the blow, but Evan teetered for a moment. Then he slipped and went down on one knee. Jordan gasped. She didn’t realize she was holding her breath until Evan recovered quickly and rose to his feet again to meet his opponent’s swing. Her father exhaled in relief, too. She glanced at him to find him nodding his head, as if he were looking at a son to find him exactly what he expected. The black knight pursued Evan relentlessly. Evan turned on the knight, ramming his sword against his plate armor. But it bounced harmlessly off. Evan brought his sword around again, smashing the black knight’s helm. The black knight appeared dazed and stumbled back. For a moment, Jordan thought it was over. Her heart beat wildly in her chest. Evan lifted his weapon high for the final attack. 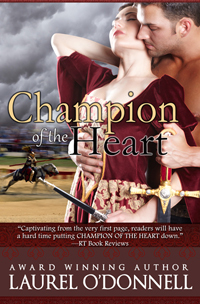 Read more about Champion of the Heart here on Medieval Romances. Champion of the Heart is available on Amazon, B&N, Kobo, iBooks and more. This entry was posted in Blogs, Medieval Romance Monday and tagged champion of the heart, laurel o'donnell. Bookmark the permalink.